nglccNY News Blog: NGLCC Awards Prizes To All Three nglccNY Biz Pitch Competitors! NGLCC Awards Prizes To All Three nglccNY Biz Pitch Competitors! nglccNY was thrilled to close out a phenomenal year of supplier diversity programming with last month’s final 2018 Biz Pitch competition sponsored by EY. Participants pitched in front of decision-makers at EY, fellow LGBTBEs, and nglccNY members, allowing the audience to witness the evolution of each supplier’s presentation as they incorporated critical feedback they received throughout the year. We were especially thrilled to welcome Justin Nelson, Co-Founder and President of NGLCC, as a spectator. 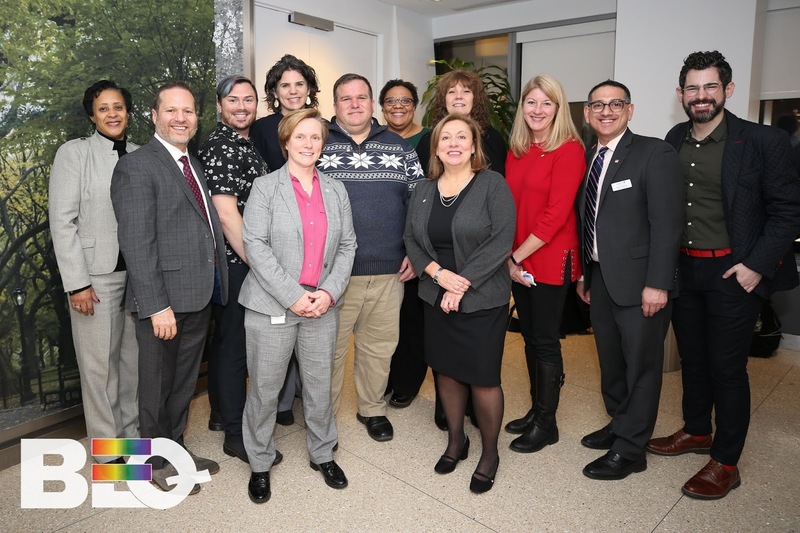 From left to right: Rose Hatcher (Viacom), contestant Mitch Lippman, contestant Nathaniel Gray, contestant Stefanie Francis, Chris Crespo (front, EY), Brad Vanderweide (EY), Theresa Harrison (EY), Florence C. Werner (front, EY), Andrea Regina (EY), Rosemary Weppler (EY), nglccNY Supplier Diversity Chair Rob Finkelstein, and nglccNY Director TJ Chernick. Photo provided by BEQ Magazine. Having placed as semi-finalists throughout the year, Hootology (January 2018 winner), The Mitch Lippman Group (June 2018 winner), and The Proud Path (September 2018 winner) educated us about their respective services and value propositions. After much consideration, the EY panel of judges awarded Stefanie Francis, Founder & Lead Innovator at Hootology, with a scholarship to the Supplier Diversity Professional Excellence, Tuck Executive Education at Dartmouth for 2019 (approximate value: $5,000), and Nathaniel Gray, MSW and Founder of The Proud Path with an NGLCC 2019 National Dinner Registration (approximate value: $750). Congratulations to Stefanie, Nathaniel, and Mitch on their achievements! All presentations were extremely well done! Our first nglccNY Biz Pitch of 2019 will take place on January 22, 2019. Applications must be submitted no later than 5:00 p.m. on January 10, 2019. To apply, please click here for more information. We hope to see you there!